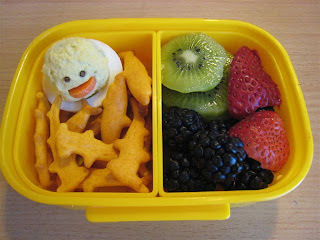 Monday's chick eggs were a hit, both with my kid and his preschool friends. He asked for another one today and since he's so cute, I had to say yes. Ben picked a chickie egg (deviled egg decorated to look like an Easter chick), some baked shark crackers, fresh kiwi, blackberries & strawberries. I do find him easy to feed.